In January 2018, I had the opportunity to test a pre-production version of Laowa's first lens in 2018 — the Laowa 25mm f/2.8 2.5-5x. 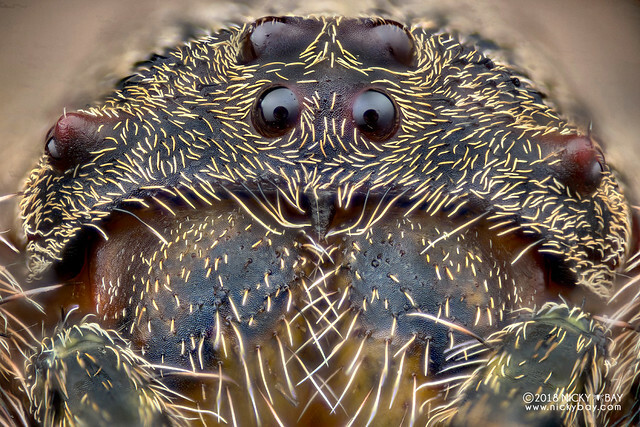 It is a niche high magnification macro lens touted to be the answer or alternative to the Canon MPE65 for non-Canon users (especially Nikon macro photographers!). 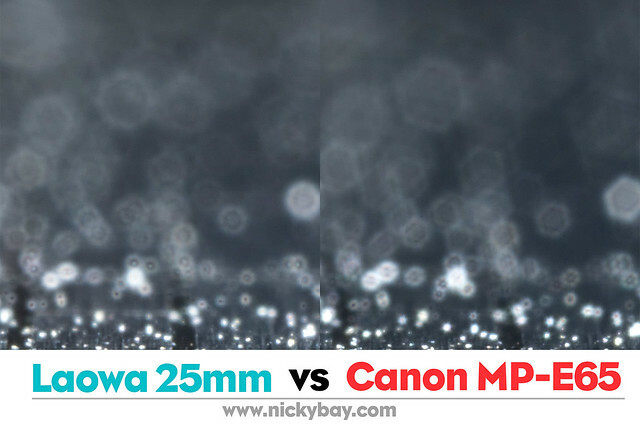 After a few rounds of testing both handheld in the field as well as on a tripod, I've compiled a list of pros and cons of the Laowa 25mm vs the Canon MP-E65. At the end of the review, I will also show sample shots of how I stacked 104mm of extension tubes behind this lens to push it to 9.1X magnification. Thanks to Victor for loaning me the MPE65 for tests, and Andrew for loaning me the metabones Sony-Canon adapter so that I could test both lenses on the same camera body. The Laowa 25mm's obvious competitor would be the Canon MP-E 65mm f/2.8 1-5x. 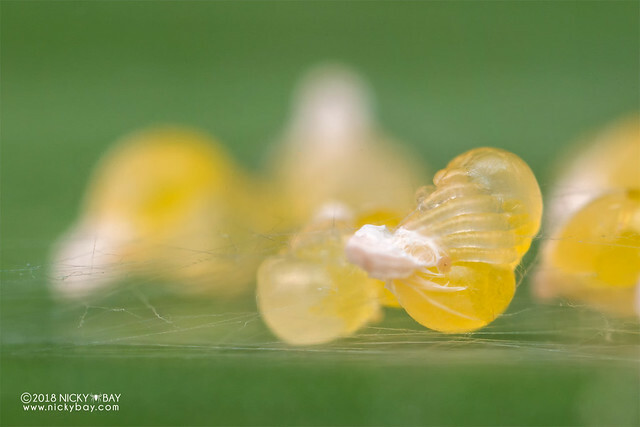 Of course, there are many ways to get this magnification range through the use of reversed lenses and bellows but in this post, I will just focus on these lenses and highlight the factors important to a macro photographer in the field. 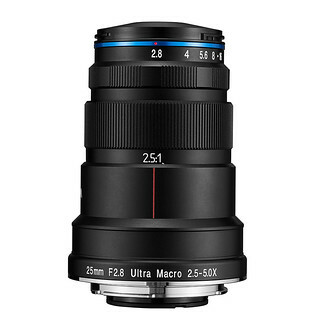 There is a lesser-known Mitakon Zhongyi 20mm f/2 4-4.5x but it is not included in this review as I have not used it before. Based on the specifications, it has a much narrower magnification range of 4-4.5x, only 3 aperture blades and a short working distance of only 20mm, half that of the other 2 lenses in this review. The Laowa 25mm is priced at less than 40% of the Canon MPE65's current retail price, making it a really affordable and portable option for high magnification photography. The Laowa 25mm is available in most major camera mounts, while the Canon MPE65 is designed exclusively for the Canon EF mount. It is worth noting that with Nikon and Canon mounts, adapters are easily available to use the lenses on mirrorless systems which would have a shorter distance from the sensor. Hence to answer many who asked, all of the lenses can technically be mounted onto M4/3, Sony FE and Fuji X mounts with the correct adapters. The magnification range determines the usability of each lens in the field. In this case, the Canon MPE65 is the clear winner as it covers a wider 1x-5x range. The Laowa 25mm has a more restrictive magnification range from 2.5x to 5x. 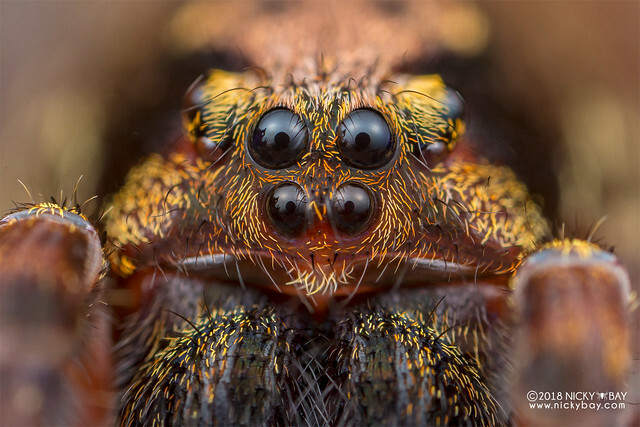 It appears to compliment the Raynox DCR-250 on a 1:1 macro lens (approx 2.5x magnification) and the Laowa 60mm f/2.8 Macro (2x magnification) lens. The working distance of both lenses at 5x are comparable, differing by only 1mm. 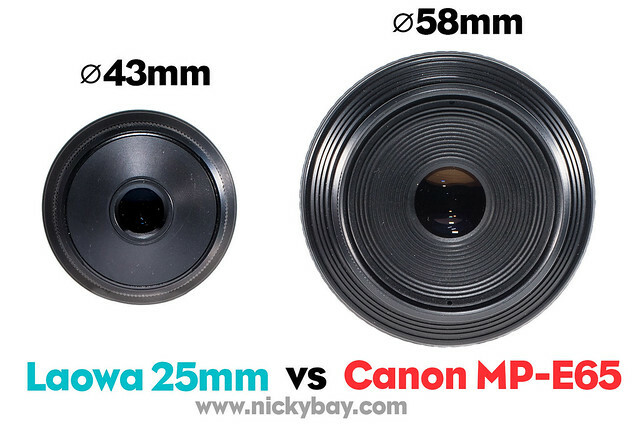 But at 2.5x, the Canon MPE65 has a working distance of 58mm, while the Laowa 25mm is shorter at 45mm. While some photographers prefer longer working distances, I prefer the working distance to have a narrower range so that the lighting set-up and results would be consistent. Having a consistent working distance also helps for those who use their left hand to control the distance between camera and subject. So no clear winner in this, as it depends on individual preferences. The Laowa 25mm looks like a baby when placed beside the Canon MPE65. A smaller lens is definitely much easier to handle. It also allows for more consistent results for flash systems that are not mounted at the tip of the lens. The Canon MPE65 had been known to be like a brick, weighing a hefty 730g. Despite the small appearance of the Laowa 25mm, it actually weighs more than it looks at 400g due to its full metal construction. 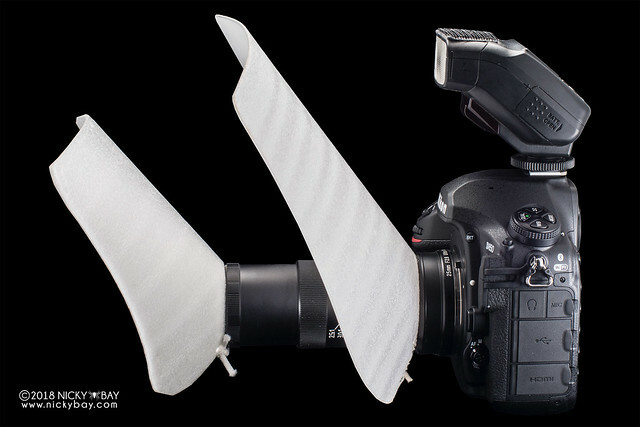 Nevertheless, it is still 45% lighter than the Canon MPE65 and imposes less strain on the arm. 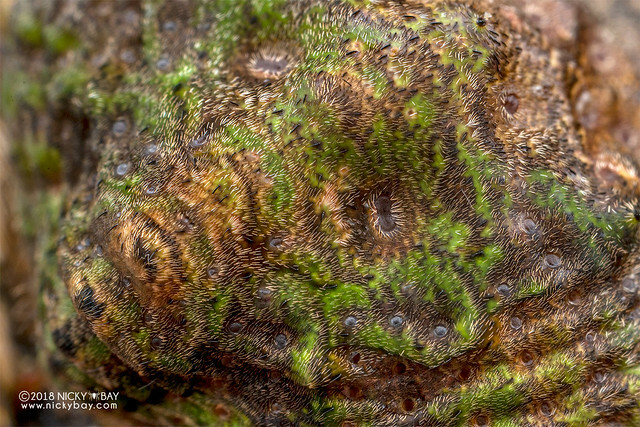 A small diameter of the frontal tip of a macro lens has a huge advantage of allowing lower angles on a flat surface, such as on the ground or on a tree trunk. It also blocks out less light, allowing for better lighting coverage. For this, the Laowa 25mm is the clear winner with a frontal diameter of just 43mm, even smaller than that of a Raynox DCR-250 (49mm). The number of aperture blades determines the shape of out of focus highlights. In general, more blades will result in rounder apertures and more pleasing results. The Canon MPE65 tends to produce hexagonal bokeh highlights, while those produced by the Laowa 25mm are rounder. Some may ask why a tripod collar is important for such a small lens. On tripod setups, having a tripod collar allows the frame to be rotated without adjusting the tripod. It is a great advantage for high magnification set-ups. For handheld situations, the tripod collar can also be rotated upwards to mount a flash or focusing light. Interestingly, the Laowa 25mm's tripod mount comes ready with an arca swiss mount. That reduces the need to screw a base plate to the tripod collar, but that also rules out usage on other mount types. Plus point if you use arca-swiss mounts. The Laowa 25mm is a completely manual lens and lacks auto aperture control, or aperture coupling. This means that when composing, the image that you are seeing is already stepped down (i.e. dark) and viewed at the actual aperture setting of your shot. This is probably its biggest disadvantage over the Canon MPE65. 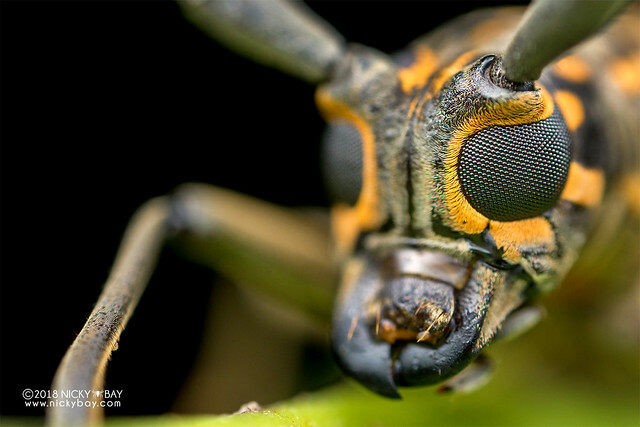 Focusing will be more challenging due to the deeper depth-of-field in handheld situations. The only advantage of manual aperture control is that it would be much easier to locate your subject in the viewfinder. Even when the subject was 1cm out of focus, it was possible to see where the subject was when the aperture was stepped down. Lack of aperture control does not affect tripod set-ups as the aperture ring can be adjusted after focus and composition is set. Although the depth of field (DOF) of each lens is the same at the same magnification and aperture setting, the DOF characters of each lens are different. Due to the wider angle of view of the Laowa 25mm as compared to the MPE65, it has a deeper "perceived DOF". Areas in the frame that are out of focus would appear clearer on the Laowa 25mm when compared with the Canon MPE65. Because the DOF fall-off of the Laowa 25mm is not as steep as in the MPE65, it is easier to locate the subject in the viewfinder when the subject is slightly out of focus. The examples above were tested on the Sony A7 with respective adapters to Canon and Nikon mounts. They are not conclusive as I did not use precision equipment to position the lens for the test. However, the Laowa 25mm does show slightly more detail for out of focus objects. 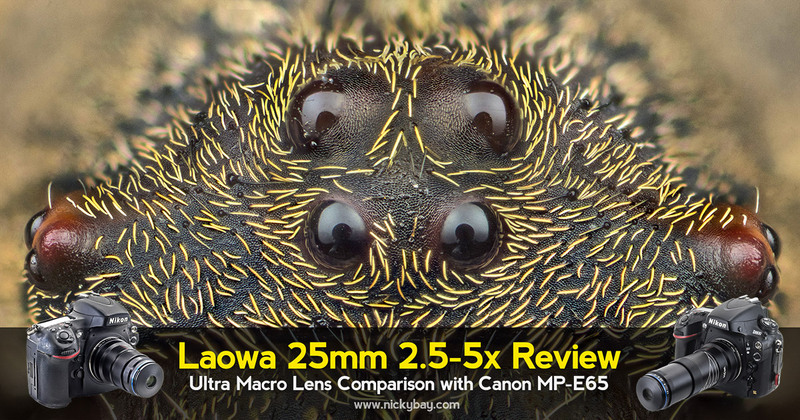 The optical quality of both lenses are on par, with the Laowa 25mm slightly sharper at f/2.8 and 5x magnification. Many others had already done detailed side-by-side reviews on image quality and I do not own a Canon body for a more accurate test, so I would not go into too much detail here. 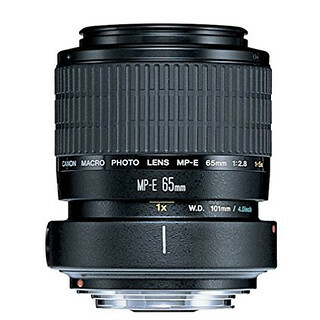 Instead, I will focus on recommendations to optimise the image quality of your shots with this lens. Those who are new to high magnification photography must know about the effects of diffraction and light loss. The effective f-stop is (Magnification+1) x f-Stop. So if one were to try 5x magnification at f/16, the effective aperture would be (5+1)x16, or a mind-boggling f/96. To minimise diffraction and light loss, I would recommend using f/4 or f/5.6 at 5x magnification when shooting handheld, or f/2.8 when on tripod. At lower magnifications like 2.5x, it is fine to use f/11 or f/16. To minimise diffraction, the settings listed in red below should be avoided while those in orange are borderline acceptable. Another important factor for better image quality when using these 2 lenses is the presence of a lens hood. I find that images from the Canon MPE65 tend to be washed out, especially with protruding diffusers. The same can happen on the Laowa 25mm as well. This can easily be addressed with a little lens hood. 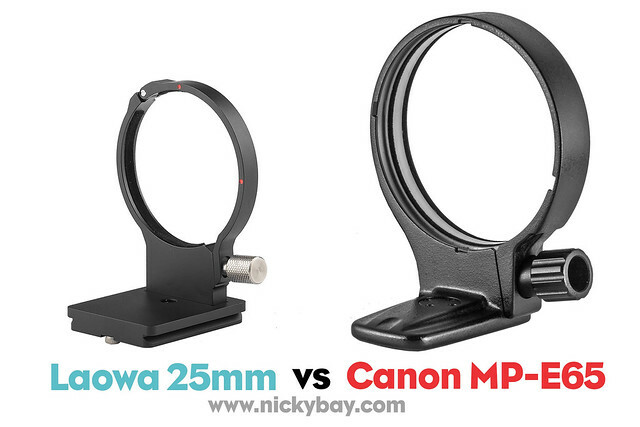 There is a lens hood available for the Canon MPE65, but some DIY is required for the Laowa 25mm. Alternatively, shift the diffuser a little further behind the front of the lens to avoid stray light from entering the lens. Locating the subject in the viewfinder is made easier when the lens diameter is smaller, when the DOF fall-off is less, and when the working distance range is consistent. In these aspects, it was definitely easier to get the subject into the frame when using the Laowa 25mm. It was challenging on the MPE65 but it can be overcome with sufficient practice. Due to the unique lens design with the aperture ring at its frontal tip, auto aperture control is not possible with this lens, leading to darker images on the viewfinder. This problem can be addressed by attaching a focusing light to the setup. I like to use T6 bike lights as they can be easily mounted onto the lens without any DIY work, with an external battery pack (not in pic) latched onto my belt to offload the weight off my hands. With this, I could see easily at 5x magnification stepped down to f/5.6 and even f/8. The bike light usually functions as a headlamp, so I just had to tie the elastic bands 2 or 3 times around the lens. The small diameter of the Laowa 25mm allows for better light diffusion as the surface area of the diffuser increases. Here's a simple light diffusion system that can be used with a single flash. 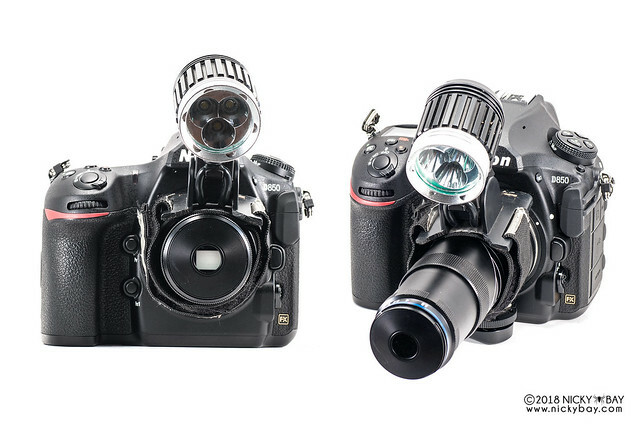 In fact, the same can also be used for dual flash systems. I used 2 layers of diffusion material made from translucent plastic (get from flexible chopping boards or plastic folios) layered with packing foam. It is lightweight, portable and easy to set up. To improve on this further, reflective materials can be wrapped around the diffusers to create a softbox. 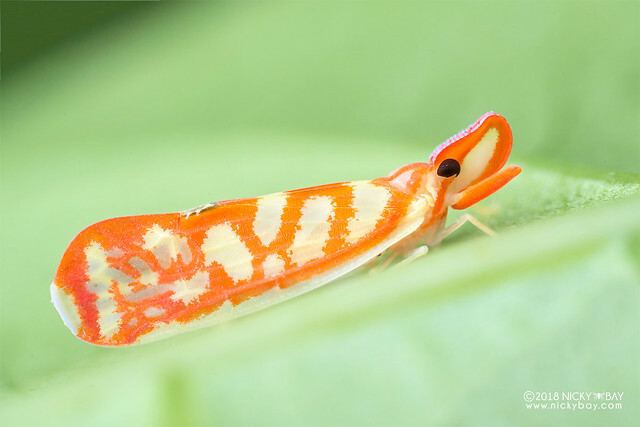 I've tried the Laowa 25mm handheld in the field, as well as for deep stacks on some cooperative live subjects. Here are some of the results. 3-shot handheld stack at 2.5x f/11. I was surprised to find the subject easily with a focusing light despite having a stepped down aperture of f/11. 100% crop from the earlier shot to show the details up close. 2-shot handheld stack at 5x f/5.6. Single handheld shot at 5x f/5.6. The DOF was expectedly thin at 5x — I took several shots before getting a decent focus. 3-shot handheld stack at 5x f/5.6. Not my usual style for such a tight crop but just to test shots at 5x. 2-shot handheld stack at 2.5x f/11. 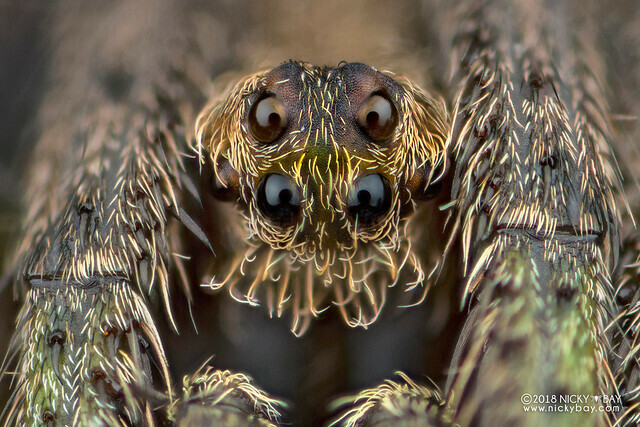 Unable to fit the entire body of this spider in the frame due to the 2.5x limitation. Single handheld shot at 5x f/5.6, cropped. I was slowly getting the hang of it! 2-shot handheld stack at 2.5x f/11, lightly cropped. 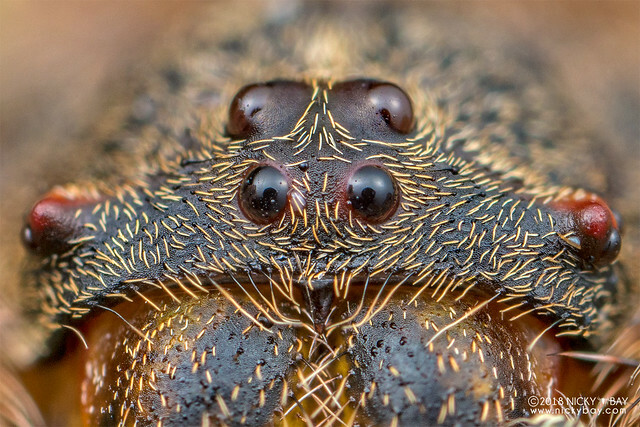 Posterior view of the cryptic spider. Single shot handheld at 2.5x f/11. 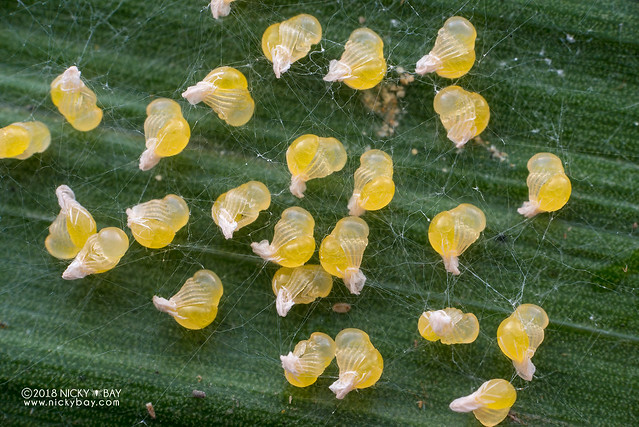 Was lucky to found these jumping spider eggs with little hatchlings emerging! Single shot handheld at 5x f/5.6. 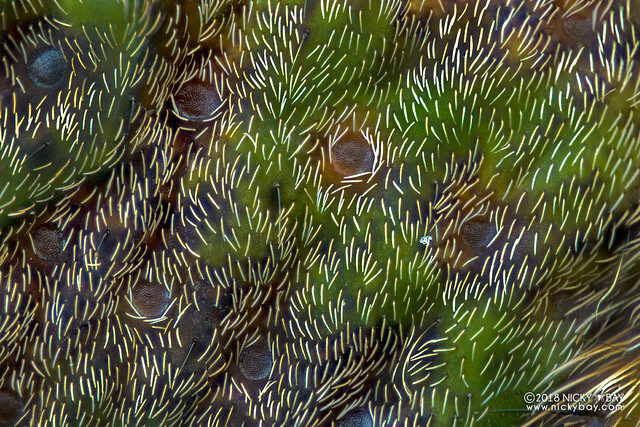 It was a really cool scene, but I realised that these little hatchlings have very little detail and is difficult to get a good image of them! 2-shot handheld stack at 5x f/5.6. Tried going at a lower angle. 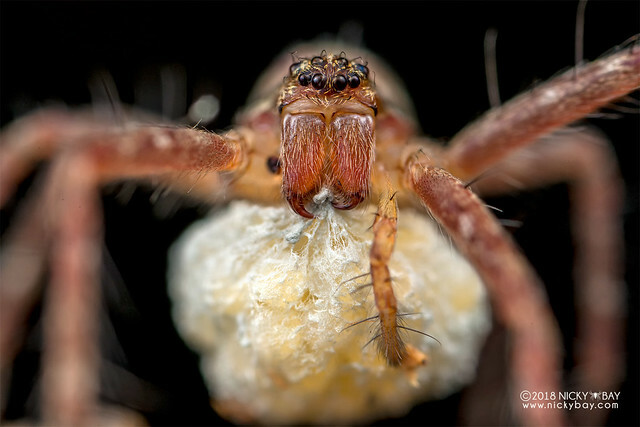 It was really easy to find the subject, but getting the precise focus was very difficult at 5x. Single shot at 2.5x f/11. 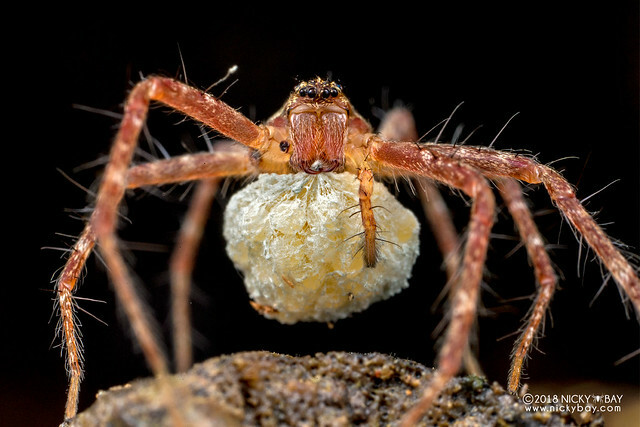 Found a beautiful pisaurid clasping onto her egg sac. 2.5x was barely enough to keep her completely in the frame. 2-shot handheld stack at 5x f/5.6. 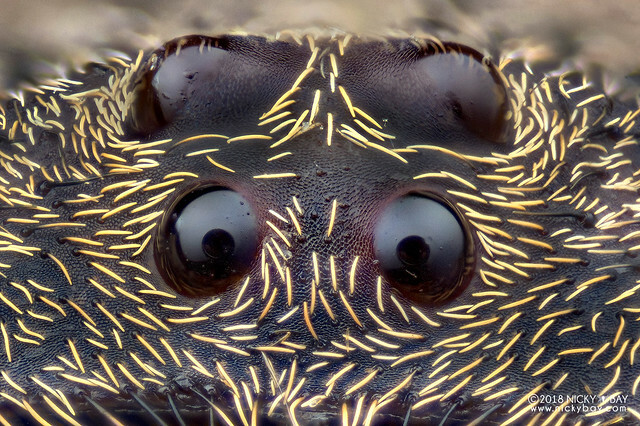 Closer view of her eyes and egg sac. 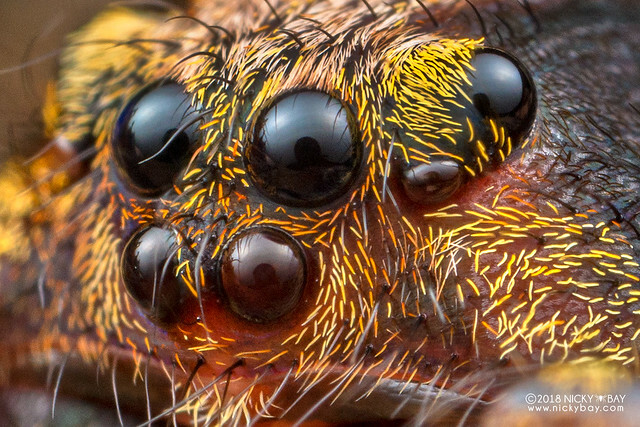 I decided to test the lens at higher magnifications by adding 104mm of extension tubes to reach a magnification of 9.1x and photograph some of the spiders that we found. The following shots were taken using StackShot on a tripod and cropped as there was vignetting. A 12V battery was brought along to power the StackShot. 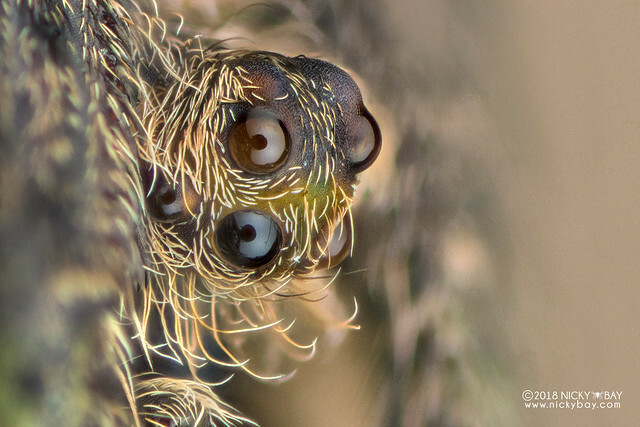 As all the spiders were very much alive when I did the stacks, some micro-movements were recorded which resulted in less-than-ideal stacks. 37-shot tripod stack using StackShot at 9.1x, f/2.8. 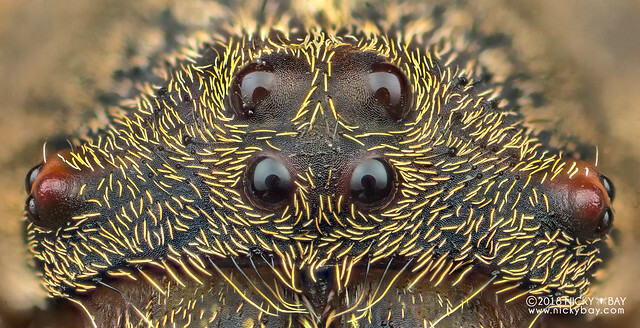 I actually took 211 shots, but the spider moved midway through the stack and I didn't notice it. 86-shot tripod stack using StackShot at 9.1x, f/2.8. View from the side shows the ocular region on an elevated tubercle. 117-shot tripod stack using StackShot at 9.1x, f/2.8. 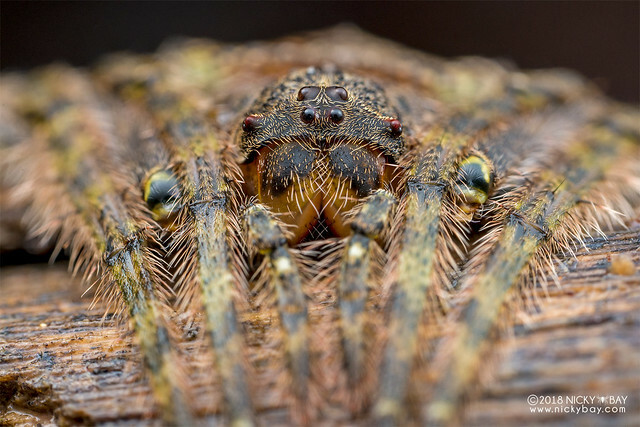 Posterior view of this wrap-around spider reveals very interesting details! 318-shot tripod stack using StackShot at 9.1x, f/2.8. 300+ shots sounds crazy and an overkill, but I probably overdid it. Cropped view of the above shot. 101-shot tripod stack using StackShot at 9.1x, f/2.8. 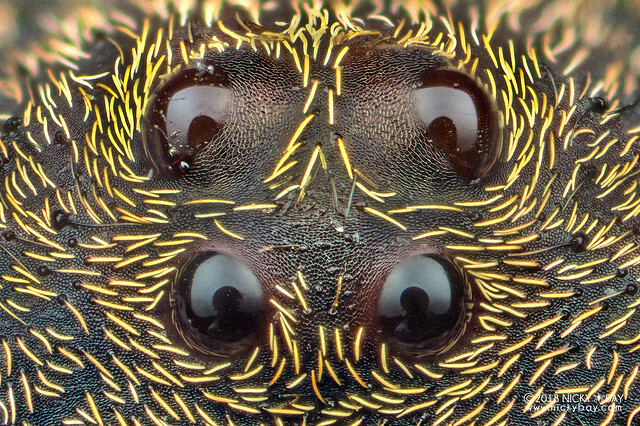 Bottom part showing the chelicerae was cropped off as it was moving while I was taking the shots and couldn't be stacked accurately. 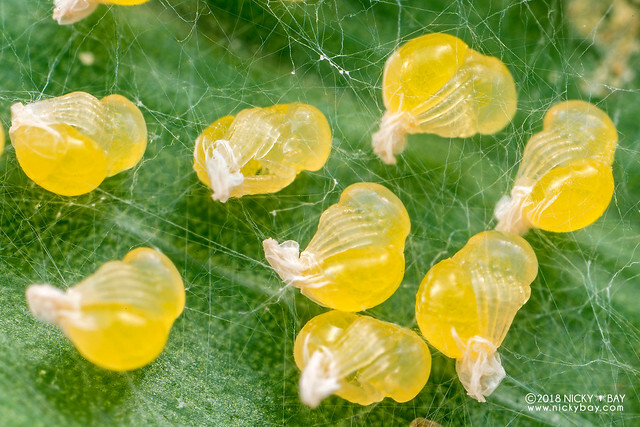 Cropped view of the above shot to show the details of the setae. The Laowa 25mm f/2.8 2.5-5x shines in most categories with the exception of its lack of aperture coupling. Without aperture coupling, handheld shooting would lose its focusing precision and the viewfinder's image would be much darker when stepped down. However, these shortfalls can be minimised with sufficient practice or use of a tripod. So the big question is — should you get it? 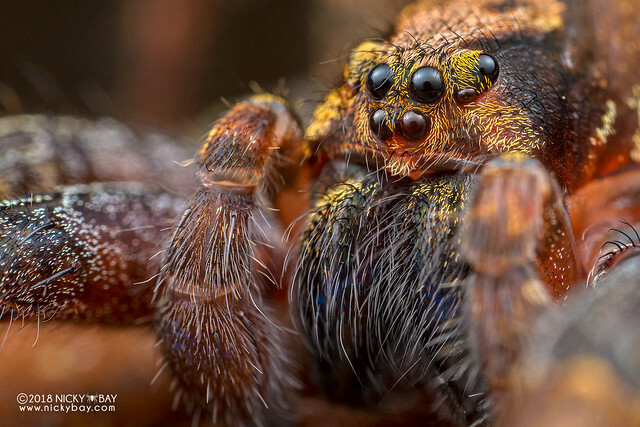 This lens is definitely a worthy purchase for fans of high-magnification macro photography, but one should be aware that nailing good shots at 5x magnification is no easy task for any beginner. Shipping is expected to start from the end of March 2018. You can pre-order now at venuslens.net or macrodojo.com (helps me if you order from here).